This is the most beautiful my hydrangea has ever bloomed. Two seasons we had late frost and it didn't bloom. It makes me smile! Beautiful! I've tried two times to grow blue one's & failed both times. Don't it make my brown eyes blue! I love this plant. It blooms on old or new wood which is important for us in zone 5 or less. 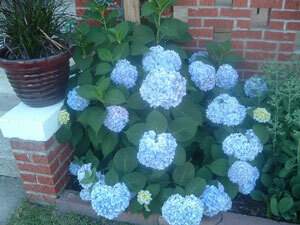 This is called an Endless Summer Hydrangea.